As we all got to witness, last week was a wild week on Wall Street as market volatility picked up suddenly and sharply. We seen the major averages plunge on Wednesday and then continue to sell off on Thursday before rebounding considerably with a bullish reversal on Friday. The CBOE Volatility index (VIX), also known as Wall Street’s fear index, soared to above 28 this week – a level it had not traded at in the past 8 months. The latest volatility has been attributed to a rapidly rising interest-rate environment, the corporate buyback blackout period heading into third quarter earnings, selling pressure from risk-parity funds, what is now views of a tariff war with China, and new uncertainty surrounding the mid-term elections. Last week was the steepest selloff since earlier this year in March. For the week, the Dow netted a loss of -4.2%, the S&P closed off -4.1%, and the Nasdaq fell -3.7%. Both the Dow and the S&P have fallen for three straight weeks, while the Nasdaq has dropped for two. From a technical prescriptive, the Dow lost 831 points on Wednesday and sliced through its 50 DMA, a line that it has continued to trade above since mid-July. The index then fell another 545 points on Thursday and closed just below its 200 DMA. From there it had generally made a successful test of that support with Friday’s decisive rebound. The S&P 500 posted its longest stretch of daily losses this week since a nine-day drop that ended back in November 2016. Like the Dow, the index was fighting to hold its 50 DMA until Wednesday, when it fell to near its 200 DMA before going on to breach and fall well below that line on Thursday. This was the first time for a close below the 200 DMA since April 2nd. Friday’s gains of 39 points, or +1.4%, snapped its six-day losing streak, yet failed to clearly reclaim the 200-day line. The Nasdaq was actually the first to break below its 50 DMA, and that happened during the previous week on Oct 4th. It took out its 200 DMA on this past Wednesday. On Friday, the tech-laden index staged the most impressive comeback of the three, on a point basis, by adding 168 points, or +2.3% – its best daily performance since March 26th. However, the index remained under what is now resistance of its 200 DMA. The jury is still out on whether the selloff signals a fundamental shift in the stock market or a brief episodic correction, and if Friday’s bullish reversal is a sign that the major averages will continue to recover their losses. Typically, after such vertical violations of the 50- and 200-day moving averages, such violent selling takes some more time to resolve itself. The 5-, 10- and 50-day moving averages are in sharp declines. Tradition would dictate that we wait for another confirmation of the strength, with a follow-through day, before doing any new buying. 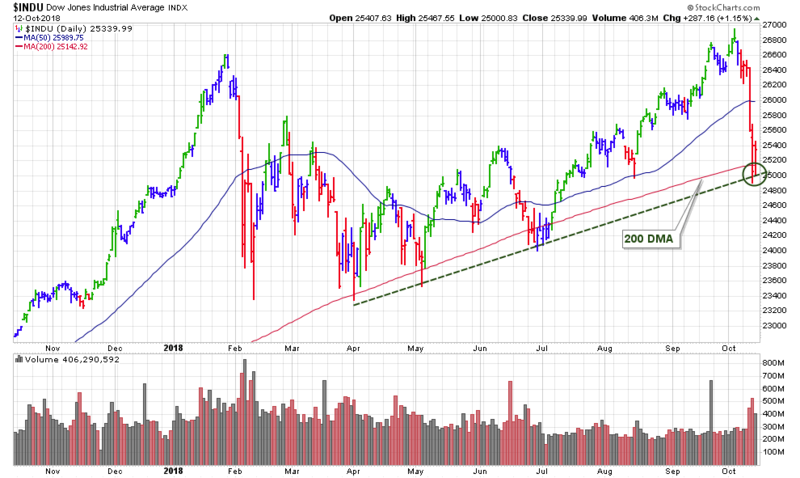 The 200-day line will be the first area of resistance to overcome, and that has already been achieved by the Dow as it fell the least furthest below there. Of note, it was very encouraging to see leading growth stocks rally sharply in the last hour of trade Friday. Friday marked the unofficial start of another earnings season. JPMorgan Chase & Co. (JPM) Citigroup Inc. (C) and Wells Fargo & Co. (WFC) all reported, possibly providing the first clues into how American corporations are faring in the second half of the year. This morning, European markets opened mostly down. Trading in Germany started late due to technical problems, before the main Dax index dropped -0.4% after an election in the state of Bavaria spelled trouble for Chancellor Angela Merkel. Markets in Asia closed mostly lower. Here at home, U.S. stock futures are lower with the Dow’s off 88 points. Bank of America (BAC) and Charles Schwab (SCHW) plan to release earnings before the open Monday. The Census Bureau plans will publish its Retail Sales report for September at 8:30 a.m. ET. I ran my routine stock screens over the weekend and added 5 new stocks to our watch list. One stock in particular is TJX which through last week’s broad market selloff, shares of this retailer remained above the stock’s 5o-day moving average and within its current base. Standard rules apply – any gains above the TRIGGER PRICE while the day’s volume is at least on pace to make the TRIGGER VOLUME would have any of these set ups confirming a BUY signal up to their MAX BUY PRICE by default.